The HAO15SIP Hi-Gain Outdoor 15dBi Omni-Directional Antenna Kit is a heavy-duty, weather proof, high powered antenna for extending the range of your 802.11b and 802.11g WiFi devices. The power rating of WiFi antennas is measured in terms of decibels (dBi). 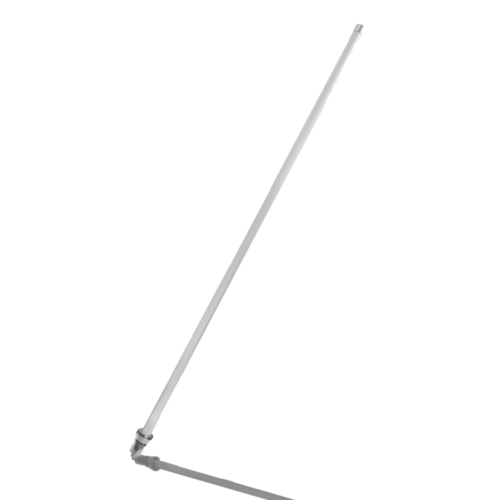 The HAO15SIP boosts the antenna power of standard antennas from a minimal 2dBi to a staggering 15dBi. This results in extended wireless distances of up to 2 miles. 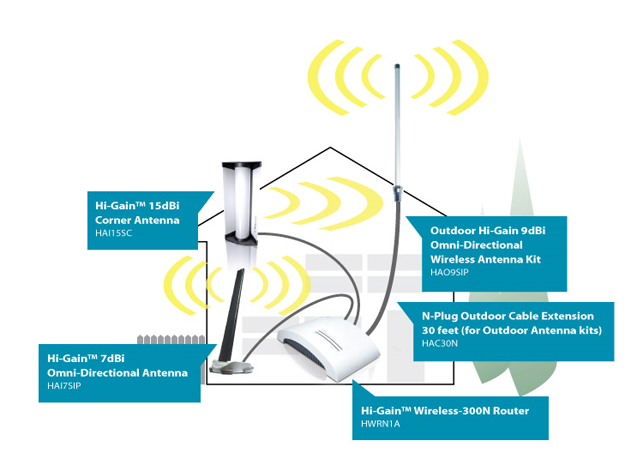 * Whether extending the wireless network from one corporate building to another, or simply from the front house to the back house, the Outdoor Antenna Kits provide wireless users with a high powered solution to extend their wireless network. 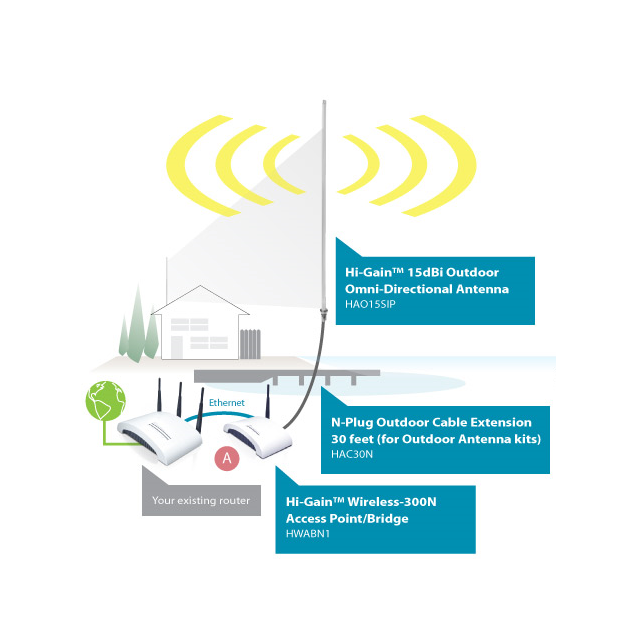 The Outdoor Wireless Antenna emits a powerful amplified signal over a 360 degree radius, delivering a strong multidirection signal from an Access Point or a Bridge. If you have multiple locations or buildings where you would like to integrate your wireless network, simply place the HAO15SIP in between the buildings with your Access Point. It is most effective when placed at the top of buildings or in the center of large rooms. The HAO15SIP Outdoor Wifi Antenna also comes with a mounting kit, connectors, and a surge protector. 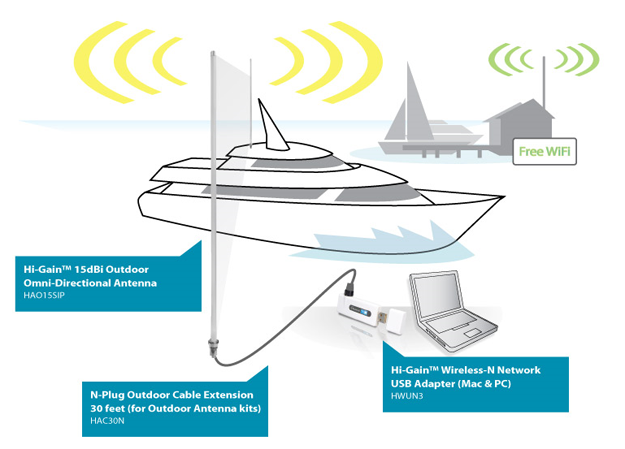 Installation of the HAO15SIP Outdoor Wireless Antenna is simple and straight forward. It is compatible with most wireless devices (Access Points, Routers, Bridges and Network Adapters) on the market with removable external antennas. The Hawking Outdoor Wifi Antenna comes equipped with N-Type, RP-SMA, RP-TNC connectors to support a wide range of wireless devices. For those devices that use adapters not included in the packaging, please visit the Hawking Technologies website for a selection of specific connectors for your device. Note: An outdoor low loss antenna cable (model number HAC10N, HAC20N, or HAC30N) is required for outdoor installation and must be purchased separately. Depending on your set up, a shorter cable is recommended for minimal signal degradation (cable loss) due to cable length. *Range Dependent on Network Conditions and Line of Sight. Maximum coverage is only valid in point to point solutions with a HAO15SIP on each end. What kind of antenna connector does HAO15SIP have? Does the HAO15SIP antenna support 802.11N?